I’ve been busy planting and adding a little window dressing to the Potting Shed! 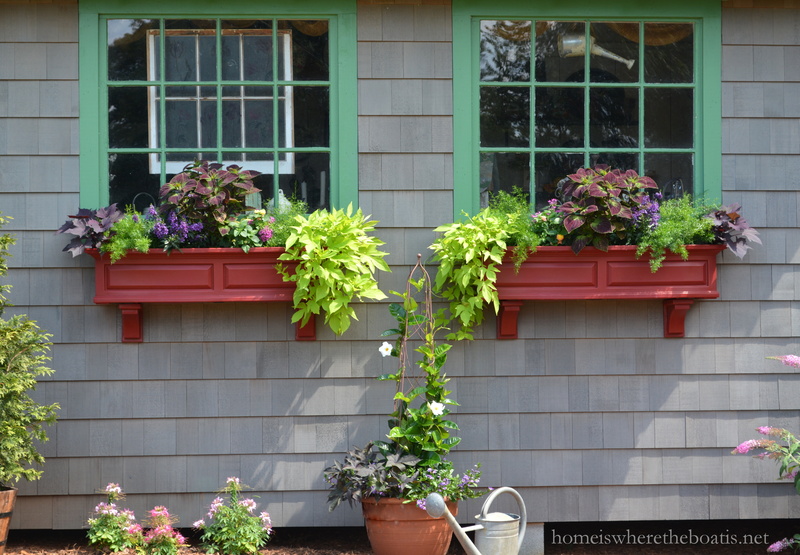 My hubby hung a pair of Happy Birthday Window Boxes for my Potting Shed about a month ago. The window side of my Potting Shed sat next the lake before her move and was inaccessible. I decided that side and was past due a face lift and in need of a little window dressing! I planted my window boxes with an assortment of sun-loving and heat tolerant annuals. 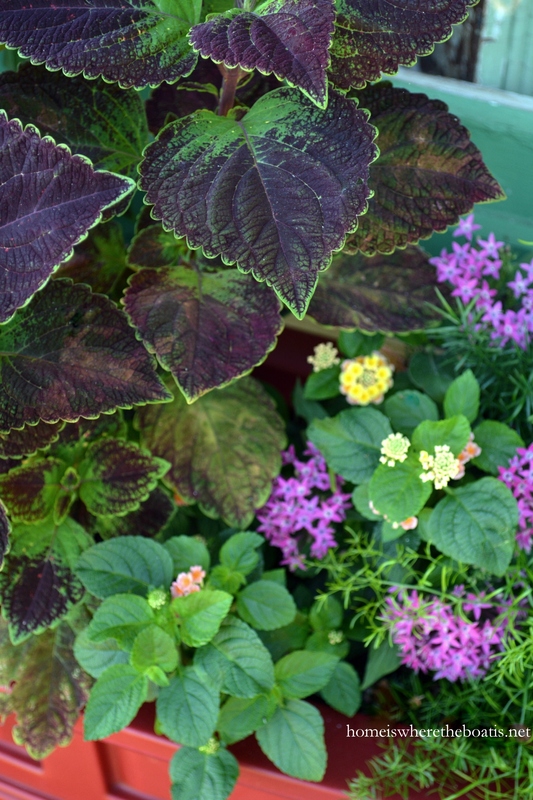 A combination of sun coleus, angelonia, lantana, and pentas for color. And asparagus fern along with purple and green sweet potato vine to trail over the sides. My windows face west so I chose a vinyl/ polyethylene material for the window boxes. 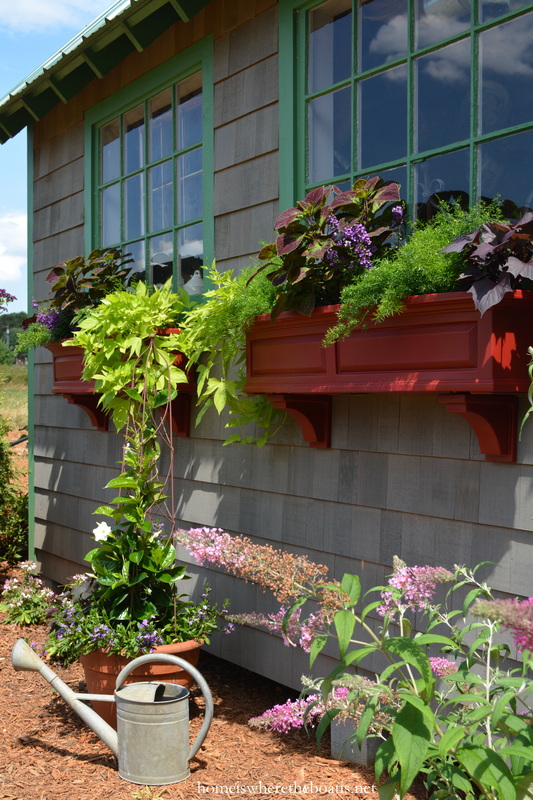 The window boxes will tolerate the UV rays here in the sunny South without splitting or cracking and the color will stay true longer than a painted wood. They also have a double wall design with a water reservoir so they’re self-watering and one of the few things I don’t have to water everyday. 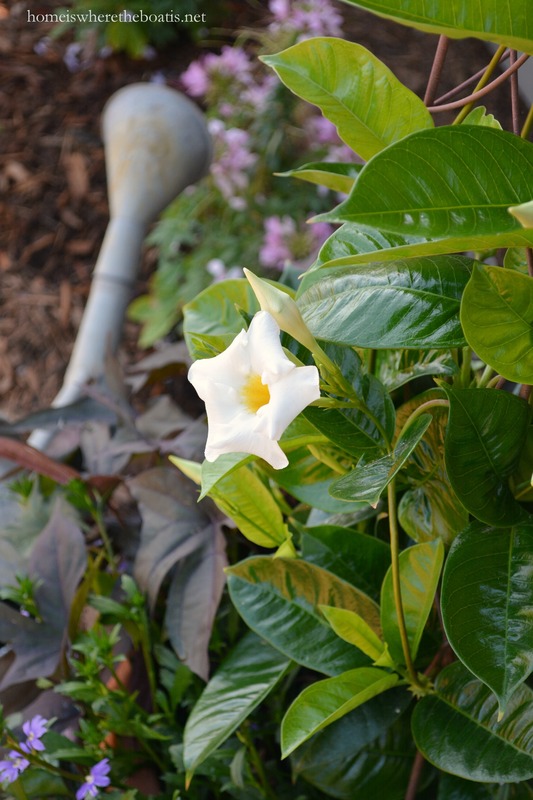 I planted a white mandevilla on a trellis in a pot that should love our summer heat and humidity. . .
My optimum temperature range is 68 – 72 degrees :) It’s 100 degrees here this week which is extreme for June in North Carolina and it’s dry. 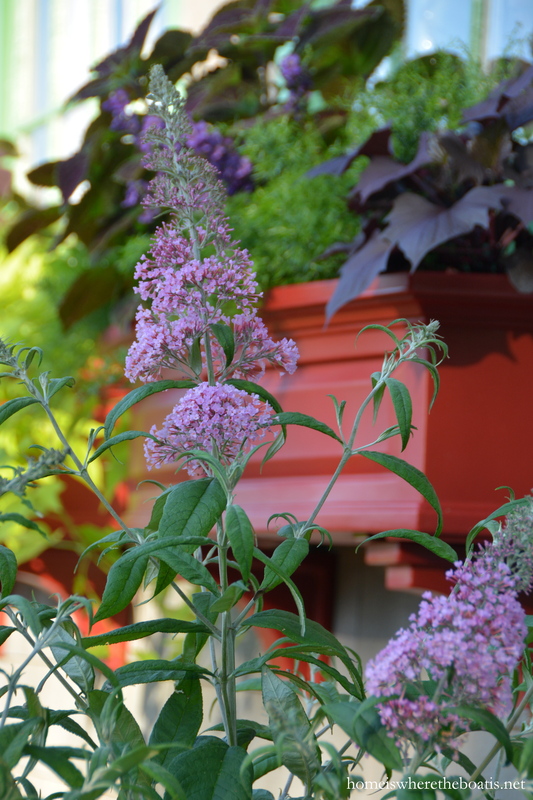 Perfect weather for the butterfly bush which is more heat tolerant than I am. Mother Nature, send us some rain, pretty please. Hope you’re staying cool where you are! You are one of my favorite blogs to read. I love your ideas and especially your photographs.I am from NC but live in Maine now, so you make me happy with your “southern” ways :-). Where in NC do you live? Mary….I need to go over to that site as i have been looking for window boxes…thanks so very much for this beautiful post today (as always)…and thanks so much for the tips on planting the heat tolerant plants…it is certainly been an unusually hot June here in NC….certainly not the norm…I am with ya on the “heat tolerant range” A beautiful, beautiful display of impeccably selected plants and flowers for your window boxes….Happy Wednesday Mary…stay cool and yes we need rain! Love your new window boxes! I agree 100 degrees is too hot. But here it is mid-June in the UK and I had my electric blanket on last night!! There must be a happy medium somewhere. And I thought your potting shed couldn’t possibly get any prettier or more perfect! Happy belated Birthday Mary! The window boxes look so incredible! 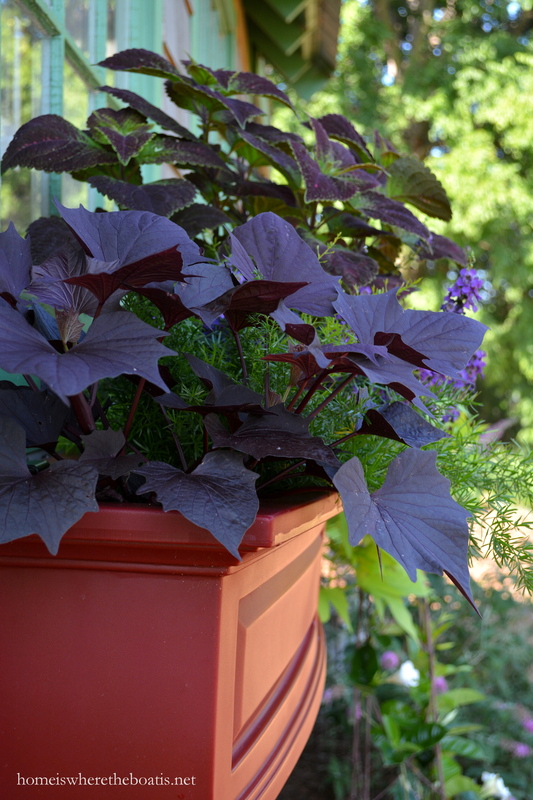 Your magic green thumbs have certainly been busy~despite the heat your plants look like they’re thriving. The color of the boxes is great, and low maintenance is always a bonus. Your husband is such a smart and handy guy! 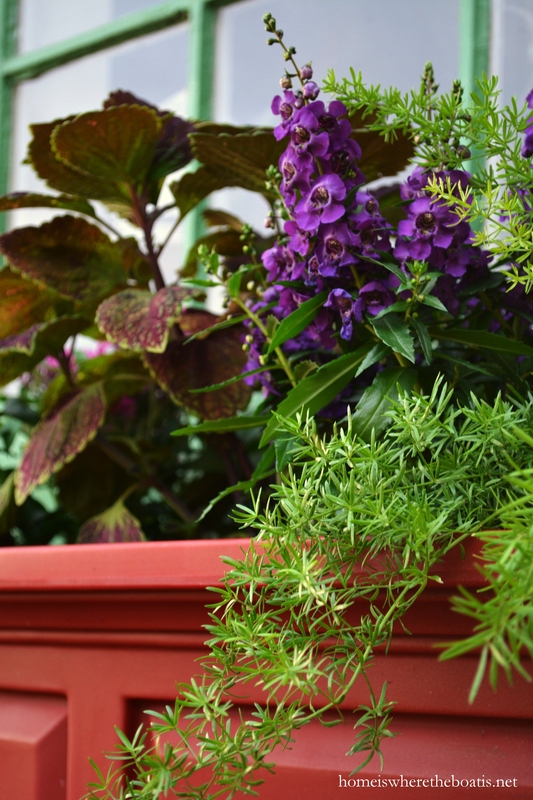 Love your posts and your new window boxes. I live in Ky. and it has been hot and humid here too. You just have the absolutely BEST BLOGS. Hands down. Love Love Love. I think we’re getting all your rain! We are extremely wet for this time of year. Your window boxes are beautiful! 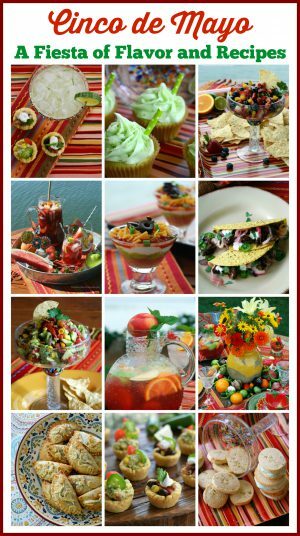 I love reading your blog and seeing what you come up with. Hope you get some rain soon! Thanks for the beautiful pics on this hot Wednesday morning in NC. 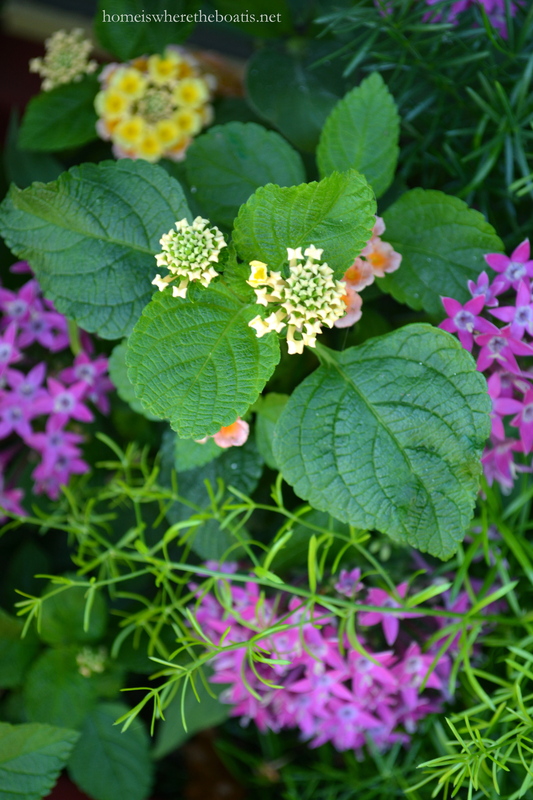 Thanks also for the info about the window boxes……can’t wait to check it out!! Happy Belated Birthday, Mary! 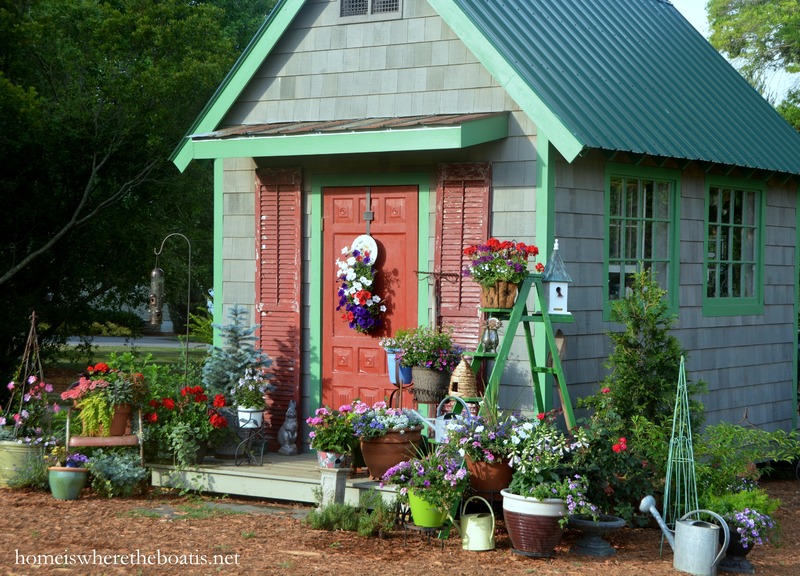 Your sweet hubby is so thoughtful to lovingly put those pretty window boxes up for your potting shed. They really do make a difference and add such beauty! Thank you for passing along the information on them. 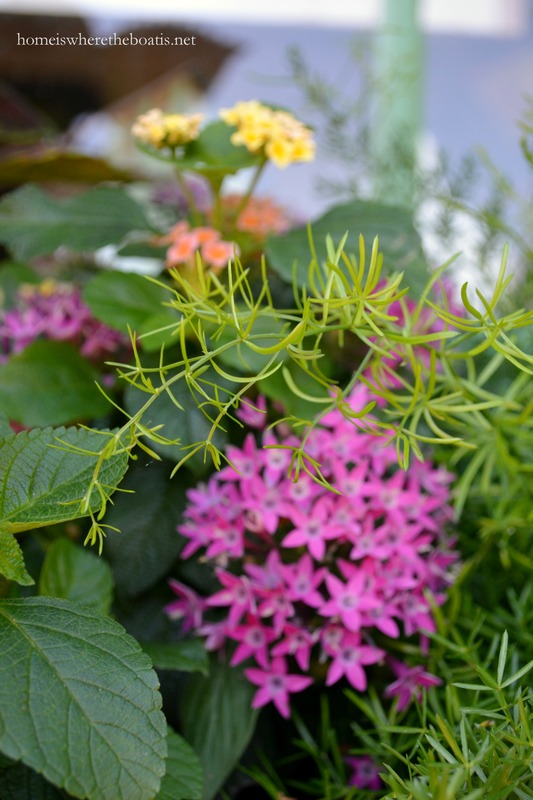 You certainly planted them beautifully with a lush assortment of plants. Love those window boxes. 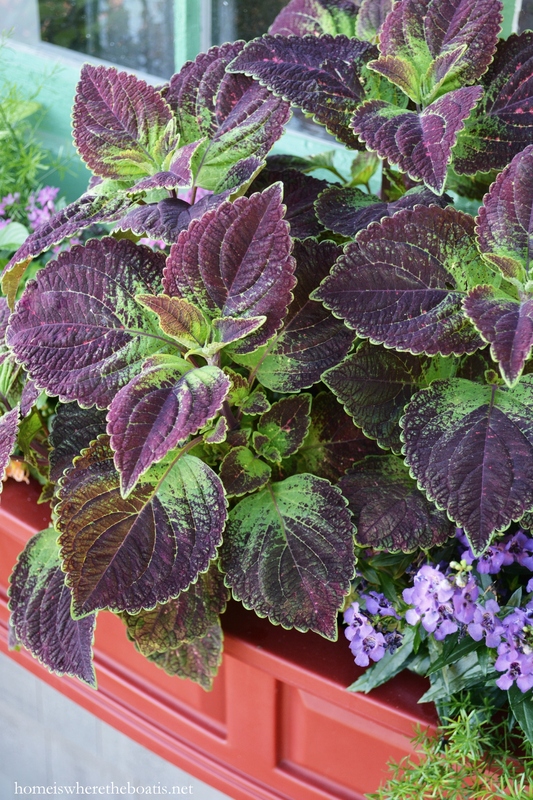 Chocolate coleus is one of my favorite filler plants too. Hi Mary, and a Happy Belated Birthday to you. 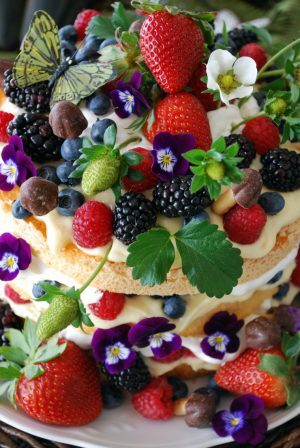 Your post is filled with eye-candy! Thank you for the info on the heat tolerant plants. Love the window boxes. I’m curious (ok, I’m nosey) is your garden shed close to your house so you can use a hose for all your plant watering, or did you have running water put in/next to your garden shed. 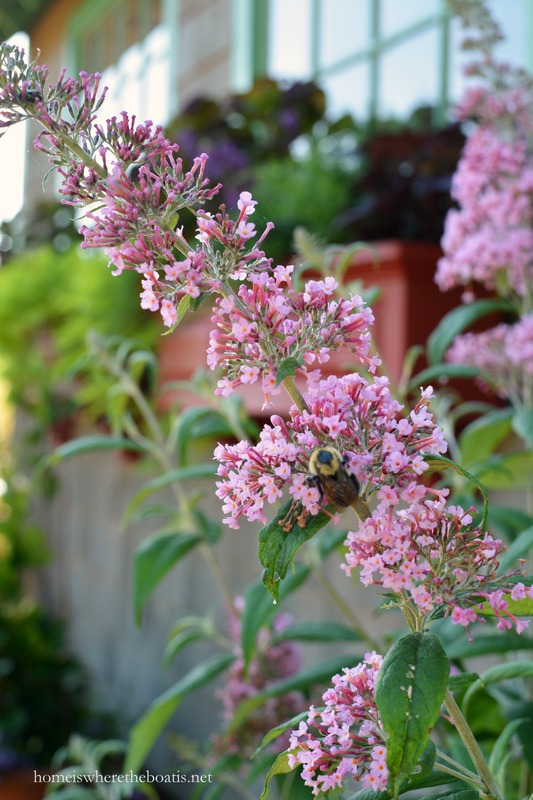 Your plants are always gorgeous and I know it takes a lot of time to water them…especially in this heat! What a lovely post to start my day here in Oregon! We may hit close to the 100’s later this week and it’s really dry as well…very unusual for us, everything is a month ahead of schedule and we have been working like crazy to get our lavender harvested. Stay cool and I love your new window boxes! P.S. … A very Happy Belated Birthday Mary!!! Perfect sun loving annuals. 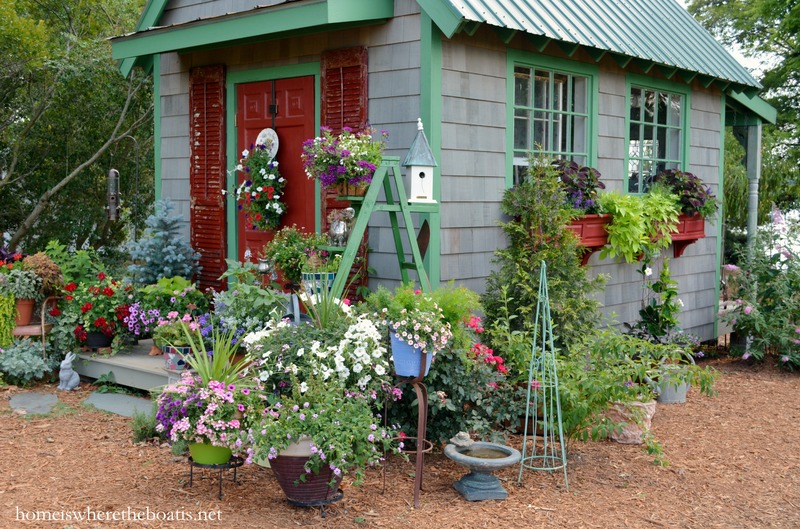 I love all the color as well as the color of the window boxes. I was out in the garden this morning. Not much color in my shade garden, it’s all green with a sprinkle of white impatient, geranium, and bacopa. I planted a white plumbago in the urns last year, more as an experiment. One seems to be flourishing, but it’s the urn where everything seems to be the happiest. Sorry you are having the extreme heat. Our June has been milder than usual. We are still getting rain too. Big storm late yesterday, though not much rain actually fell here. I always love seeing how you change things up with your shed. 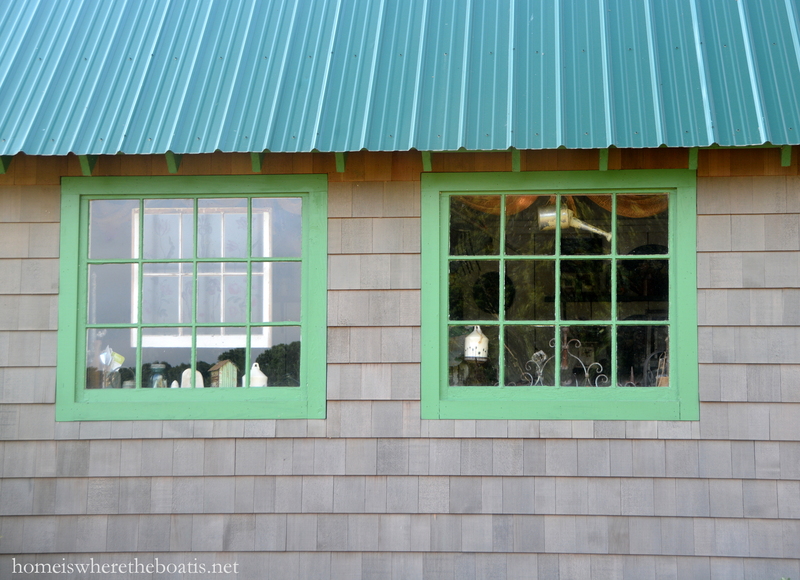 I love the green trim and windows with the new flower boxes. O, I do love window boxes and yours is just perfect. I didn’t know if Sweet Potato vines liked a lot of sun…thought they loved shade the best…I am in my first yr of container gardening and have sooo much to learn. First thing I DID learn…containers are PRICY…..thanks for all your tips and pretty photos. Your window boxes are gorgeous! As usual I love this Mary! I have planted the same coleus this year and it is doing beautifully, despite the heat. ( I located in Clemmons, about 1 1/2 hours from you.) Your window boxes are lovely! You have such a great arrangement of flowers there and it all looks so great! The window boxes are a nice addition. 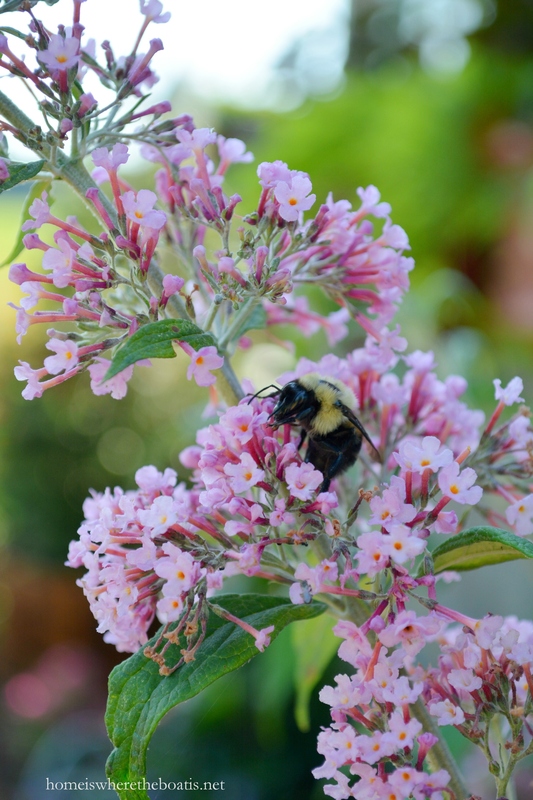 There are several plants there like the lantana and butterfly bush that will really attract the butterflies- they really really love the butterfly bushes! I like you pull out a very long hose and water everything which takes a while but I don’t mind. Starting early in the morning gives you a chance to enjoy the peace and quiet and cooler temps of the day. We’re enjoying comfy temps so far and grateful it’s not too hot. I too don’t do well in the extreme heat. Thank goodness for air conditioning! Hi, Mary–believe it or not, your temps are much cooler than ours here in AZ…we’re at 113 at the moment! We don’t complain much about our dry heat, because you don’t have to shovel it in the winter! But, dry heat or not, it’s still HOT! 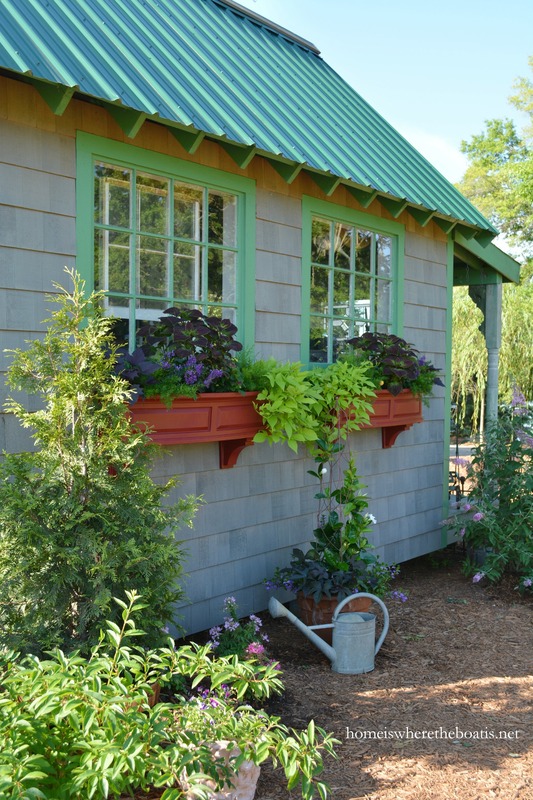 Love your new flower boxes…they add even more character and charm to the shed. Enjoy your day…. My window boxes on my west side sure get beat up with the wind, which is a not good on the flowers. 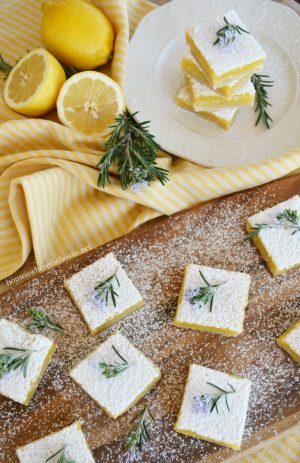 What kind of evergreen you have growing there ? pretty. Yesterday and today was very nice here in northern Indiana ! Thanks Paula! I’ll let you know when I put in plumbing and a bed :) It a Leyland Cypress that’s about to out grow its pot and needs to be planted. Fantabulously gorgeous window dressing, Mary! I’m in Cary and have lived here about 3 years now and I STILL can’t keep anything alive! I either forget to water or overwater and just when they start to look okay…the wind/storms crush everything. This early heat wave beginning- of-summer has been absolutely horrible for me!!! Your flowers are gorgeous. I would love a potting shed one day especially a lovely one such as yours. Happy Belated Birthday to you. 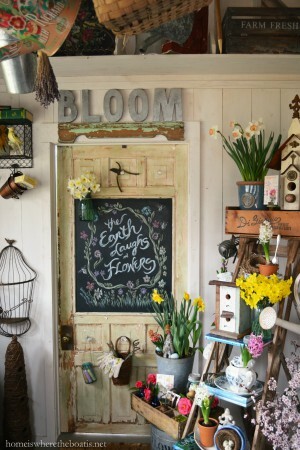 Your potting shed and flowers are just gorgeous. 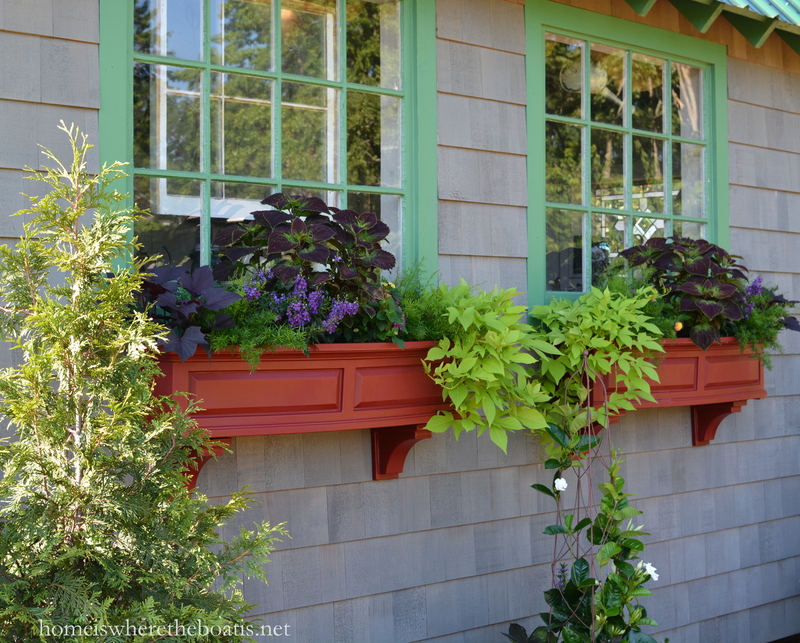 I love the colors and the pretty window boxes. Your images are beautiful. Have a happy day! We are roasting here too. We live at 4,000 feet elevation and rarely reach 90 degrees let alone the 100’s we are having now! Especially in June. Well that felt good to get off my chest! I actually wanted to comment on how beautiful your window boxes are. Lovely choice of combination of plants. I appreciate your telling us the source of your purchase too. That is so thoughtful. Maybe we should all put out big flood lights and enjoy our yards in the middle of the night!!! 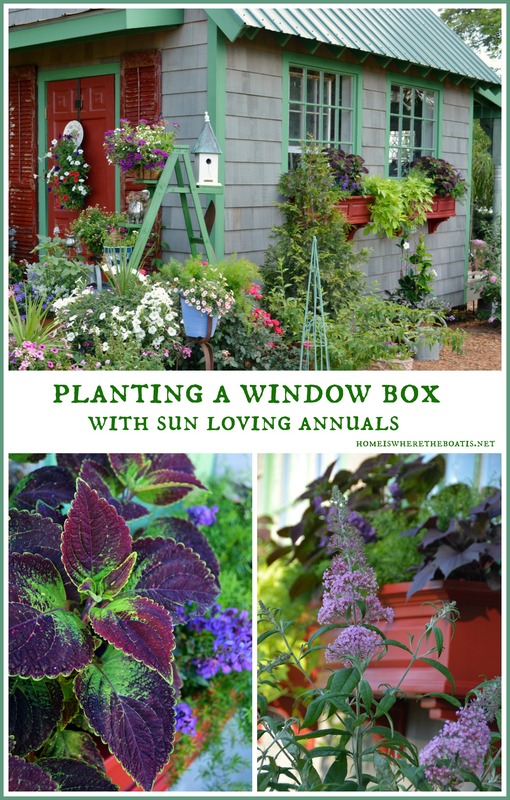 Adore your window boxes! I have been thinking about adding them on the bottom windows at the Burger to amp up curb appeal. Self watering! I’m in. 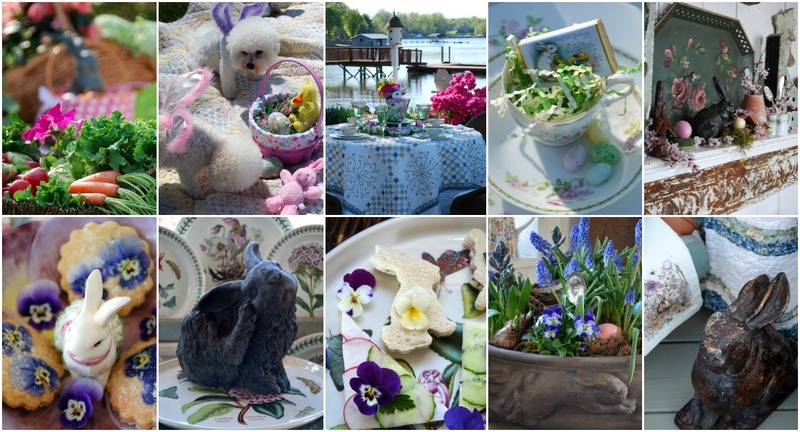 Just beautiful, Mary!